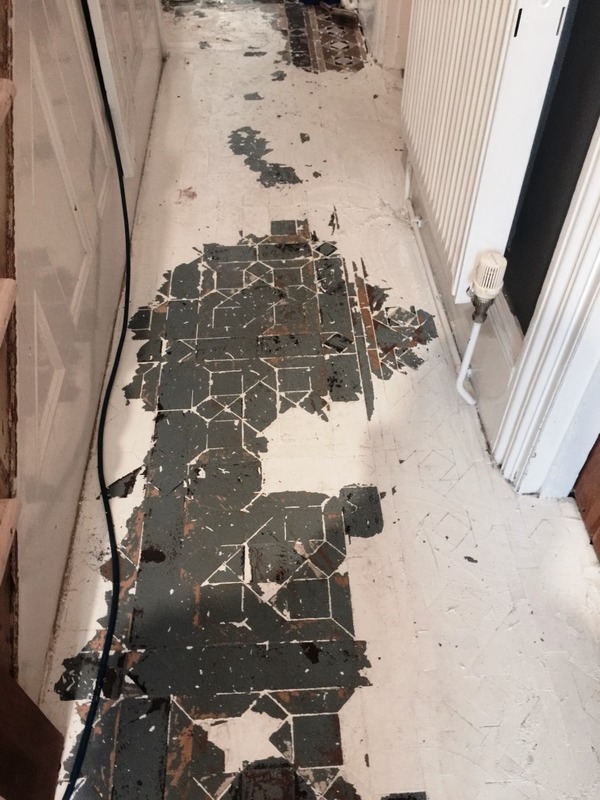 For whatever reason, property owners do sometimes decide to cover up their tiled floors, whether by using something like linoleum or, in some cases, simply painting over the area. Personally I blame that BBC TV series Changing Rooms for some of these disasters and I wouldn’t be surprised if they were to blame for what had occurred at this flat in Putney which believe it or not is an ancient parish that was historically part of Surrey as opposed to London. The property owners had re-converted the building from two converted flats back into a single dwelling. However, the previous tenants of the bottom flat had decided to paint over the Victorian tiled floor in their section. 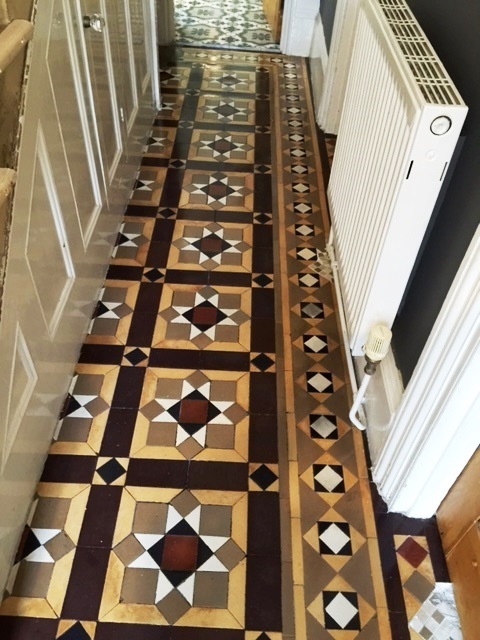 Naturally the new owners wanted to have this paint covering removed, and for the Victorian tiles to be restored back to looking their best after a long time of being hidden. Here’s how I did it. To remove the layer of paint from the surface of the tiles, I needed to use a solvent remover product specifically designed to remove paints, this was applied liberally to the affected area and left to dwell. While the solvent remover was working its magic, I set about cleaning the remainder of the tiled area using Tile Doctor Remove & Go. Remove & Go also contains properties designed to break down solvents, as well as adhesives, along with any old sealer remaining on the tiles. This also helped to lift away any trapped dirt. I then scraped off the top layer coat of paint and was left with a grey undercoat. To lift this out of the tiles and grout I used Remove & Go in combination with a steamer. The heat of the steamer helped to strip away the excess paint, making removal a much easier process. 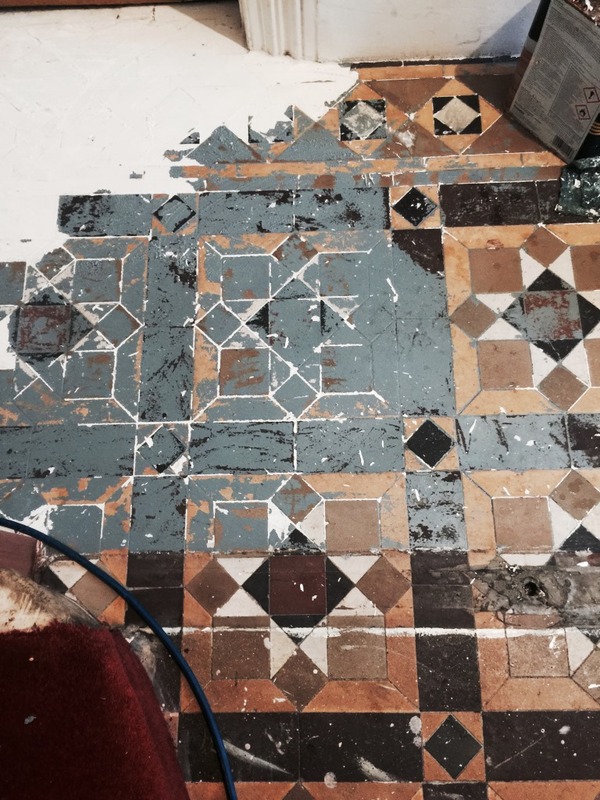 After leaving the area to dry for a full five days, I returned to the property to reseal the tiles. My choice of sealer was Tile Doctor Seal & Go, which is a water-based blend of acrylic polymers designed to provide both a stain resistant surface seal and a long-lasting low-sheen finish. It is suitable for use on most kinds of unsealed, porous surfaces, including Slate, Quarry and Sandstone but works really well on Victorian tiled floors. 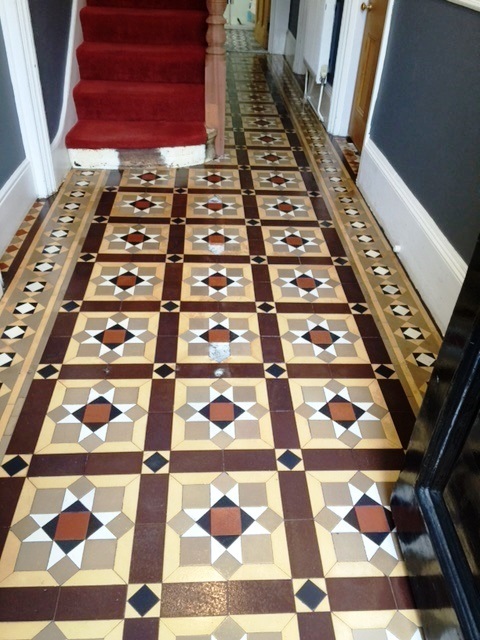 The photo below shows the before and after results of the work, with no traces of the paint covering remaining on the tiles. 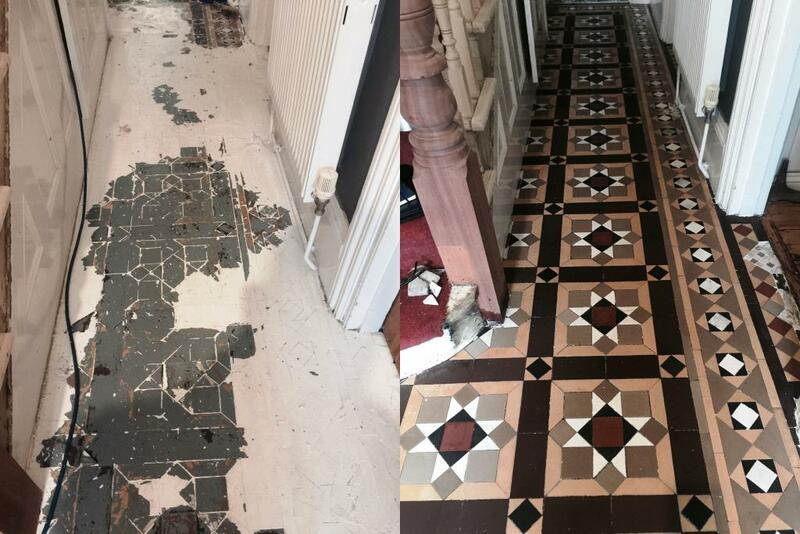 It is a wonder why someone would choose to cover up such a fantastic Victorian patterned floor, but needless to say my client was very happy with what is for all intents and purposes a brand new feature for their property.